Fruit and vegetables are particularly important for preventing heart disease, stroke and many forms of cancer and by increasing the proportion of vegetables in our diets, we may also significantly reduce the carbon footprint of our diets. In Wales, only around 7.1% of our shopping baskets are vegetables, when veg should actually make up 20% of all the groceries we puchase to meet the Eatwell guidelines. Only 24% of the Welsh population reports consuming 5 + a day, and only 20% in the most deprived areas. 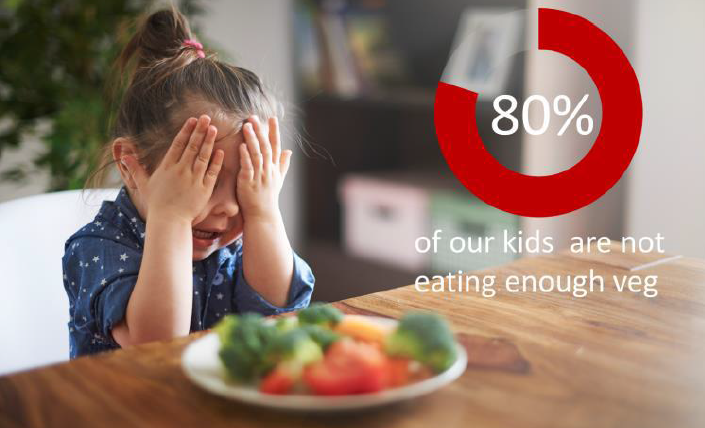 This growing inequality in diet is evident at a young age in Wales with the gap in levels of obesity of reception age children now 6.2 per cent between those living in the most disadvantaged areas (14.9%) and the least disadvantaged (8.7%). The collaborative approach taken with our partners in Wales, UK and beyond (e.g. with Holland) holds closely to the goals and ways of working of the Wellbeing of Future Generations Act. The ultimate aim of Peas Please is about improving health outcomes for all, but along the journey adding to prosperity for food producers, manufacturers and food service companies. We have made a fantastic start in Wales. Cabinet Secretary Lesley Griffiths welcomed the launch of the Peas Please initiative at the Royal Welsh in July last year, which was also supported by the Chair of the Food and Drink Wales Industry Board. The Wales Vegetable summit, held at the Pierhead and sponsored by Jenny Rathbone AM, was one of 3 simultaneous events across the. We celebrated all 40 pledges at this event but in particular the 14 secured in Wales which included flagship Welsh businesses such as Castell Howell Foods, SA Brain and Co Ltd and Puffin Produce. A summary video of all the Vegetable summits can be found here. Pledges made by Cardiff Council, Cardiff and Vale UHB, Universities and local businesses announced contribute towards Cardiff becoming one of the first “Veg Cities”. The Veg cities campaign, which will go live on 3rd May and will subsequently be adopted by other cities and places, has been developed in conjunction with Sustainable Food Cities and features case studies and resources from Cardiff. Cardiff continues to develop its campaign as part of its emerging Food Strategy. In March we held a pledgers conference in Birmingham to discuss the implementation of Peas Please pledges and build a common vision for the direction of travel of the initiative. As part of Peas Please we are also trying to address the very low advertising spend on fruit and vegetables. Vegetables make up 1.2% of food and drink advertising spend in the UK and to draw attention to this challenge we launched an advertising competition for Ad agencies in collaboration with Sir John Hegarty and Hugh Fearnley-Whittingstall. The winning ad is now on show in 5000 locations across the country including thousands of schools in Wales and all Co-op til points and until recently appeared as a graffiti on the Taff embankment. Our vision is to create an independent brand manager for vegetables which uses the full range of marketing techniques to increase the UK’s consumption of vegetables. We will talk directly to consumers and also depend on our partners in retail, restaurants and the media to take the message to their customers. The fund will drive attitude change to vegetables to ensure that the policy and practice changes being driven through Peas Please are met with increased demand from consumers. October 2018 will see the launch of our first Peas Please report. We have developed a monitoring and evaluation framework and will be collecting data from our pledgers between now and July to begin evaluating the impact of this work.